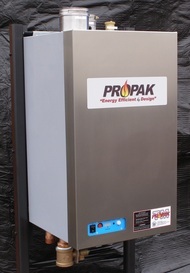 PROPAK® TM model boilers and water heaters provide up to 99% operating efficiency. Combining a space saving, wall mounted design with large BTU capability makes these boilers ideal for today’s small equipment rooms. And durable stainless steel construction means these units are built to last in the toughest environments.